Bruichladdich is one of the eight distilleries on the hebridean island of Islay, located on the Rhinnes of Islay at the top of Loch Indaal. It was originally built in 1881 by the three Harvey brothers and owned by that family until 1936. In the decades that followed, the distillery went through numerous owners, before eventually being closed in 1994. The owners at the time, Whyte and Mackay, thought they had more than enough distilleries to concentrate on such as their Dalmore and Jura brands. However, it was not closed for long. In 2000 it was purchased by a group of independent investors and re-opened a year later after the entire distillery had been dismantled and reassembled. Much of the equipment however is the same as it was in the late 1800’s, making it a rather unique and interesting place to visit. The distillery prides itself on this fact and its usage of traditional whisky making skills. Despite this, they are seen as a very modern operating distillery, particularly when it comes to their experimental expressions and quirky bottles. Bruichladdich produces three variants of whisky, each given a different brand name. First is the Bruichladdich brand distinguished for being the lightest, floral, sweet citrussy and malty of the three. 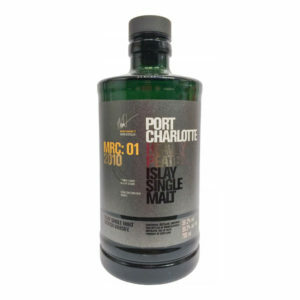 Second there is the Port Charlotte brand which is heavily peated and very typical of the Islay style. It's smoky, oily and heavy. Finally there is the Octomore, an extremely heavily peated malt that has taken the whisky world by storm in recent years. It's PPM (Phenol Part per Million) measurements are through the roof (the most heavily peated in the world), so this whisky is not for the faint hearted. Despite the extremely powerful presence of peat, the whisky manages to maintain some real class. The more you drink, the more you will start to experience a whole world of notes behind that peaty exterior (but don't drink too much or you might not taste anything! ).